ROOM eloquently combines the tension and reality of a true-to-life crime story with dream-like storytelling. Inspired by 5-year-old Jack’s point of view on life in and out of captivity with his young mom, this dreamy quality is beautiful and entrancing. Only intensified by one of the world’s most immovable forces, a mother’s love. The title, ROOM, is also the pronoun with which the main characters refer to the tiny backyard shed they are locked inside. Jack, played by Jacob Tremblay (THE SMURFS 2, BEFORE I WAKE), talks about room in the loving way that only a child could, “good morning room,” he says each morning. But his mother, played by Brie Larson (THE SPECTACULAR NOW, SHORT TERM 12, DON JON), is living in a hellish alternate reality, unlike the one she has painted for her son. 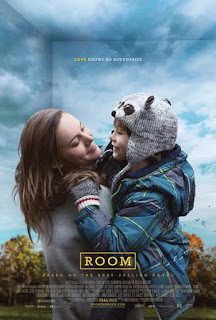 ROOM is based on Emma Donoghue's 2010 novel. Kidnapped at age 17, the young woman has been locked in this small space for seven years. She became pregnant with her captor’s child, and is devoutly raising the child in the horrific conditions. He calls her Ma. Horrors inside captivity are treated with tact by the filmmakers. Though the audience feels the unimaginable weight of repeated sexual assaults on Ma from the captor (known as Old Nick), they take place offscreen. Another example of how we view the story though Jack’s experience, as his Ma goes to great length to shield and protect her son from their current reality. They survive on weekly deliveries of essentials from their keeper. Her teeth are rotting, but she keeps Jack on a rigorous dental hygiene schedule. Light moments between the mother and son are fun and heartwarming. Director Lenny Abrahamson’s ability to build such a dynamic and powerful world in such a small space is exceptional, and it’s a special thing to experience. But only the first half takes place within the otherworldly room. The story continues with the mother-son’s journey in the real world where – ironically – neither of them is comfortable. Reality outside the room is totally new for both of them, time has moved on without them. For Jack - who knows nothing outside captivity - he is experiencing everything from pancakes to trees for the first time. It is powerful to see how much he actually loved their life in captivity, that his mom was his entire world and he didn’t want for much at all – maybe just some candles on his birthday cake. On the other hand, Jack’s mom is faced with a new reality of overwhelming change and post-traumatic stress in the real world. Poignant moments, like looking through high school yearbooks at old friends, are heartwrenching. She points out girls from her track team, “you know what happened to them?” Jack replies, “no.” “Exactly,” she said. Her life to this point cannot be undone, cannot be fixed. The story can only go on - c'est la vie. Each character is perfectly cast, Brie Larson is wonderful. The script was perfectly paced. I truly enjoyed this story and the care with which the movie treated the realistic characters. And now I’m going to call my mom and tell her I love her. 4 out of 4 stars.